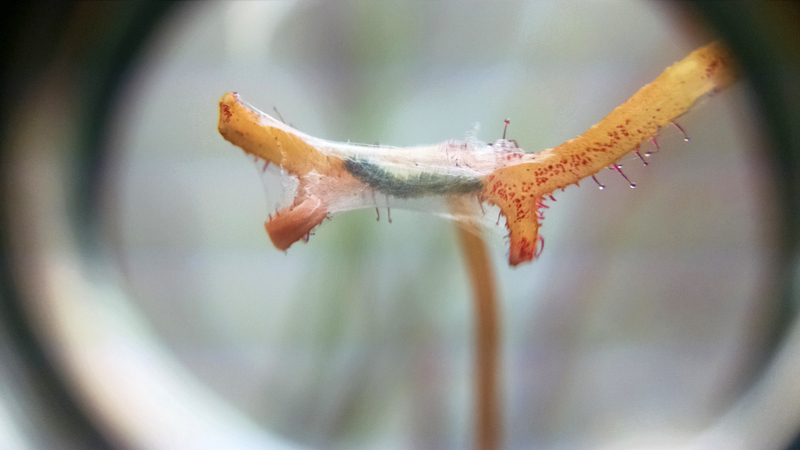 Something's living on my Drosera binata |Sundews Etc. It's important to spend time with your plants! Even when I'm very busy I try to find at least a few minutes a day to look over my collection. This gives me a chance to actually enjoy the weird little carnivores I spend so much time and effort (and money!) collecting and cultivating. It also gives me a chance to check on the health of the plants, problems with pests, all that sort of stuff. 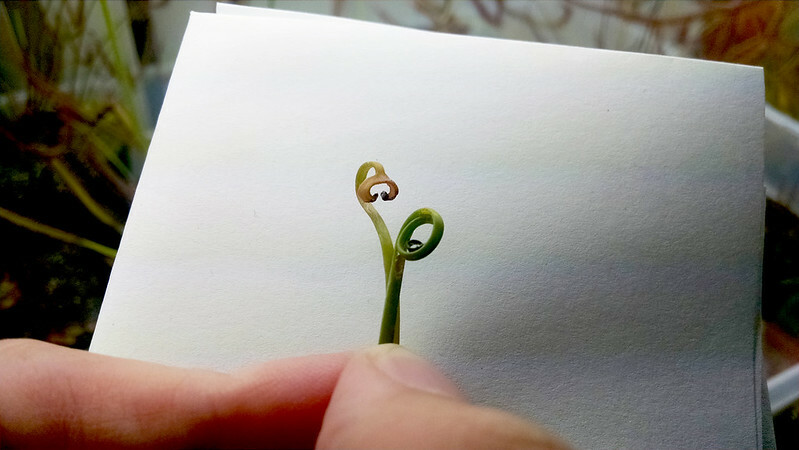 Today while I was looking things over I spotted something very weird on one of my Drosera binata clones. I almost didn't notice it at first! Do you see it? On the laminae of that half-opened orange-colored leaf right in the middle? Computer, enhance image. Up close and personal with the weird little bug. Huh. Now where did you come from? It appears to be some sort of caterpillar which must have snuck in from outside, although I'm a little perplexed about how. 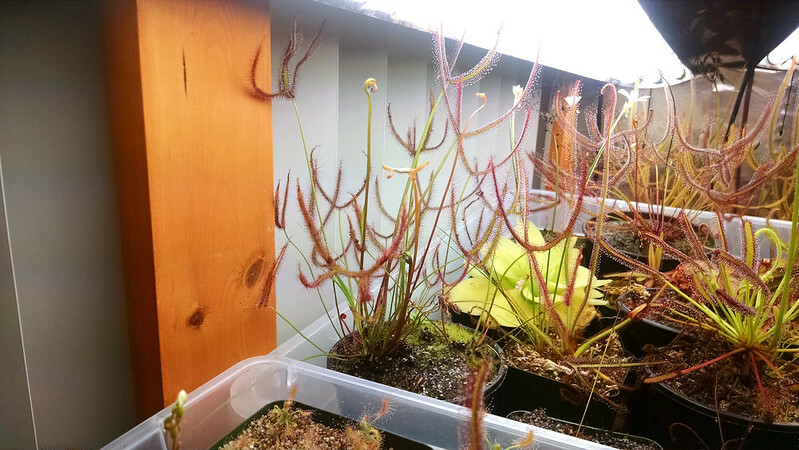 I brought a Drosera capensis in from outside recently, but it's in a separate tray, and there's a big, deep gap between them, to say nothing of all the water. Nothing else has migrated in from outside. It's quite perplexing. This little bugger seems to have done a bit of damage. Besides this leaf, the development of which seems to have been halted, there were two others I noticed that had a bit of webby silky looking stuff on them and withered tips. Two damaged leaves that I trimmed. If these are the product of this little bug (and that's all I can figure at this point, since the rest of the plant is growing fine), I definitely don't want to let it mature into some egg-laying moth or other. Still, I couldn't quite bring myself to just toss it outside and kill it – I was too curious. This feels like some 2nd grade science project. 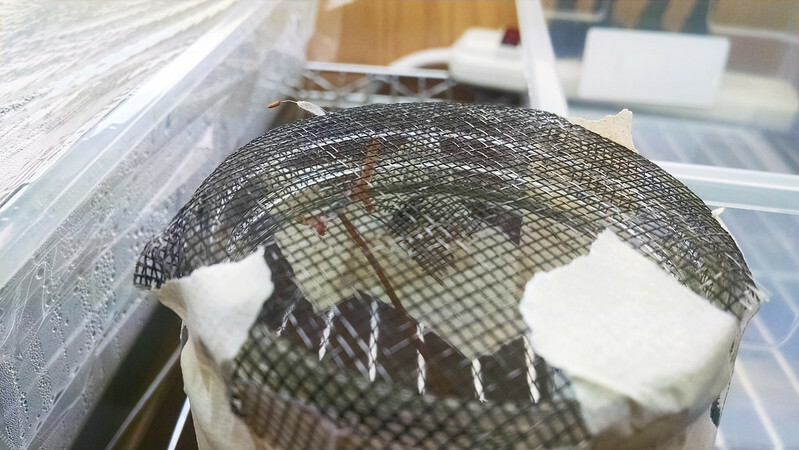 This is a crude little terrarium made of a mason jar and some old window screen to see if the little dude develops into anything menacing. There's a layer of pebbles at the bottom, along with some water to keep the trimmed D. binata leaf hydrated. It's back under my lights, and I guess we'll see how it goes! Plants that are doing great!